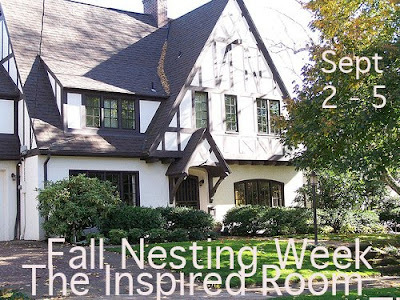 This week I have been participating in "Fall Nesting Week" with The Inspired Room. We are sharing our fall decor, projects, and ideas, to gather some fall inspiration. These faux pumpkin topiaries have been in the magazines the last few years, so last year I thought I would try it out with an old urn I had found. This urn weighs a ton and about sent my husband to the hospital trying to load it into the car. I decorate it seasonally, and my fall motif is my favorite. I didn't glue it because I wanted easy storage, but I did cut out the bottom of the pumpkins, so they would sit easier and more secure on the one underneath. That's it! I've seen some lighted and carved which are also wonderful, this one is pretty plain, but I tried to dress it up with varied pumpkin colors and some ivy and fall berry garland. I think it makes a somewhat elegant fall statement for my entry hall. and all the other participants for Fall Nesting Week. Hi Deb!!!! LOVE IT!!! and we are not even into the Fall spirit yet!!! On Monday, to participate on Junkin' Monday, just come over and add your link. We'll have Mr Linky ready for you! You did a beautiful job! I have always admired those. Beautiful blog!! This is probably my favorite pumpkin topiary I have ever seen! I love the different colors and the giant urn. Too cute! Good idea not to glue for packing it all up for storage. It looks so pretty. I hope to do some Fall deco shopping this week and next weekend I intend to drag out all my boxes of Fall decos and there are quite a few of them since I tend to go nuts for Halloween. Great job. I really like the one on top...wonderful color! Hi Deb. Thanks for stopping by my blog. I love what you've done with your topiary. Have a great weekend! It looks SO cute! Great job! What a great pumpkin topiary. Hi Deb, LOVE LOVE LOVE IT! Thanks to you I've just added one more fall project to my list!!! LOL! I'm just heading down to the shop, and caught your comment. Love the way that this turned out! I may have to give it a whirl. I have a urn that would work well....hmmm, thanks for the great idea! Looks wonderful. I love your vintage urn with the pumpkins stacked! I have a vintage Urn cast iron urn in my entry hall too! Please come on over and visit sometime!